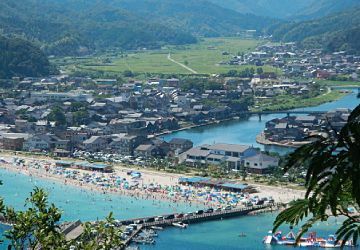 Nekozaki Peninsula, found in Takeno near Takeno Hama Beach, juts out into the Sea of Japan and is the northern-most point in Hyogo Prefecture. Nekozaki in Japanese means crouching cat and looks like such from inland. 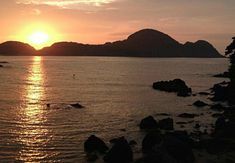 The locals also give it the nickname of Kewpie because it looks like a sleeping Kewpie from the coast to the east of the peninsula, the head being the tip of the peninsula. There is a hiking and nature trail that is easy to follow and is easy to walk along for most of the way. There are some steep inclines, declines, and stairs along the way, so sturdy shoes should be worn and caution should be taken in slippery conditions. There is also only one path so it is easy to follow. The hike is about 2.3km one-way and takes about 2 hours round trip. 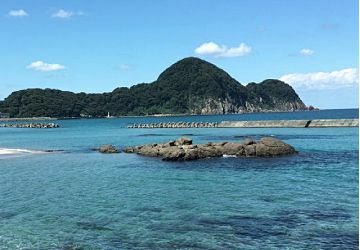 Along your hike you will come across giant’s kettles (potholes in the coastal shelf that have been eroded by the waves, prehistoric footprints of deer and dwarf elephants and 87 stone Ojizo-sama (bodhisattva statues that protect children and travelers)) that are connected to the 88 hallow grounds of Shikoku. The 88th statue is kept on the Rukaiji Temple grounds in the town of Takeno. At the end of the trail is Nekozaki Lighthouse, this marks the end of the trail and the northern-most point of Hyogo Prefecture. A view of Nekozaki Peninsula from the east side on the coast. Can you see the sleeping Kewpie with its big belly? 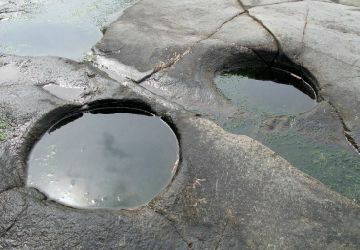 Here are a couple of giant’s kettles or potholes that you can find carved into the coastal shelf that are a result of erosion from the sea. 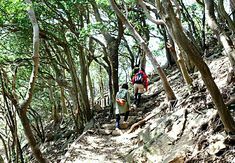 Part of the trail will take you on a narrow path through the thick forests of the peninsula. A beautiful hike in the autumn when you can see the changing of colors. At the highest point (on the back of the cat or the top of Kewpie's belly, depending on how you decide to see the peninsula), you can see over the coastal town of Takeno. 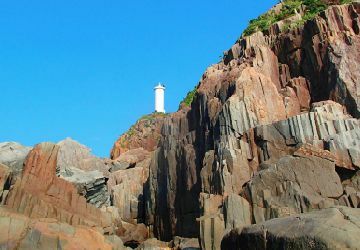 At the tip of the peninsula is a white lighthouse standing watch over the cliffs that jut up from the Sea of Japan. On days with good weather and if conditions are just right, you can find fishermen on the lower rocks of the cliff. At the end of your hike and if you have the time, stick around for a beautiful sunset. A public park that is open year round, although hiking after nightfall is not suggested. Hike time: About 2 hours round-trip. Tips: Sturdy shoes should be worn and it is a good idea to bring water and a snack.